President-Elect Barack Obama made waves when, in his victory speech, he told his two daughters Sasha and Malia that they would indeed be getting a Presidential puppy. While it is kind of unusual to use a major speech to buy your daughters a dog, there have been Presidential pets as long as there have been Presidents. In fact, there have only been two Presidents who didn’t have pets (Franklin Pierce and Chester A. Arthur). 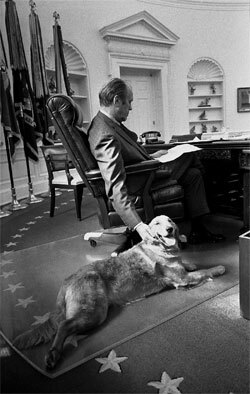 Dogs and cats are neat, and they make great pets, but they’re positively boring compared to some of the most unusual Presidential Pets. Take, for example, my favorite President of all time. Teddy Roosevelt was an environmentalist before there was even an environment, and as such, he couldn’t be satisfied with a mere dog or cat. No, among Teddy’s many pets were a bear cub named John Edwards; guinea pigs named Dr. Johnson, Bishop Doane, Fighting Bob Evans, and Father O’Grady; and a badger named Josiah. I bet they were all pretty pampered pets, too. Isn’t Fighting Bob Evans the coolest name for any pet ever? I’m not entirely sure if he’s named after the person linked, but that’s what Wikipedia came up with for Fighting Bob Evans, so why not go with that?